For sportspeople and entertainers it is fairly easy to measure success, as it is for those in business – but if you are setting up and running an art exhibition made up of paintings and other crafts created by amateurs who have attended your classes, how do you know whether it was a success or not? That was the dilemma facing Droitwich-based art tutor Pam McGregor when she planned her first art exhibition in Alvechurch three years ago, with paintings and other artworks from people she had worked with in the village hall on Thursdays during term time. So she started a book for visitors to write down their comments. Now three years – and three exhibitions – later, the book continues to be used and continues to reflect how the public views the exhibition as an event and the artwork in particular. Pam, who is a trained graphic designer and artist, but who now prefers helping others uncover their artistic potential rather than painting herself, started her classes in Alvechurch about five years ago, with one class on a Thursday afternoon. Soon it became evident that there was a need for a second class – but for people who have not done much or any art since, well, perhaps their schooldays. Pam started a beginners class, of just half a dozen people, on Thursday mornings, taking participants from the very basics of colour and different types of paint to creating their own works of art. Pam comments, “After the first exhibition in 2012, and some excellent press coverage in The Village magazine, more people asked to join the beginners’ group and there were also requests for an evening group for people working full time. The second exhibition, in 2013, resulted in more positive feedback (and yet more group members) and the success of these two, and the comments received, were the driving force for what appears to becoming an annual event. 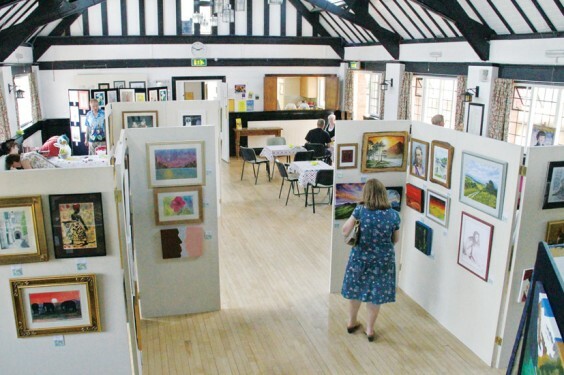 This year’s exhibition was held in July in the village hall. Several artists sold pictures, and comments like “Some really stunning art”, “Brilliant art and gives me inspiration” and “Great to see exhibitions of this standard in Alvechurch” will ensure this becomes a not-to-be-missed event on the Alvechurch calendar. There is even a suggestion of a mid-year “mini exhibition” and possibly a website devoted to the artists’ work – Village readers will be the first to hear of these if and when they happen.